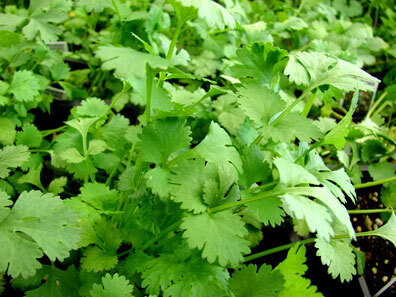 Cilantro grows fast in the cool weather of spring and fall, creating a rosette of lacy leaves. It has a pungent odor and is widely used in Mexican, Caribbean and Asian cooking including salads, salsas and soups. For best flavor, harvest before flowers appear in summer. It needs at least 6 hours of sun daily. Water as needed all season to keep soil evenly moist. Pinch off flowers for best leaf production. Feed with a vegetable fertilizer. Note: The cilantro seed is known as coriander.